Have you taken a trip recently? Or maybe you got a new puppy and kitten that you’ve taken 48,000 photos of? How about simply documenting the progress of a project, like a greenhouse-come-gaming-shed? Or I know: you’re proud of your holiday, animal children, or building prowess and want to share it with the world — no, the universe. A slideshow is just what you need. We will look at a few different tools you can use to create your slideshow in Windows. They’re all free and cover a range of technical abilities. Let’s go! Software used to make a slideshow can vary between an extremely basic picture application to advanced video editing software used by professionals. You might not need everything that comes with the advanced software, so take some time and consider what you want from your slideshow How to Create Movie and Photo Slideshows With Music How to Create Movie and Photo Slideshows With Music Get creative. You spend all that time taking little videos and photos of everything you do, just to leave them electronically rotting on your hard drive. What a waste! Read More . VideoPad looks somewhat complex on the surface, but it only takes a few moments to get a slideshow video up and running, complete with your own music and custom transitions. I’ve made a short video illustrating how to quickly create a slideshow using images and music from your computer. As you can see, it only takes a matter of minutes to get a slideshow up and running. I’ve used Freemake Video Converter in the past to bulk convert image and video formats, and it has always performed well. It performs similarly well creating a simple slideshow and converting your images into a nicely formatted video. It has very basic options, but the drag and drop and automatic creation should do nicely if you’re not looking for advanced features. Bolide Slideshow featured in a several “best slideshow software” lists, so I thought it best to try for myself. It has a similar interface to VideoPad, and is extremely easy to use, like Freemake Video Converter. I think it straddles the middle ground quite nicely. Take a look at this short video illustrating how to make a basic slideshow Bolide Slideshow Creator: Create Slideshows In Video File Formats Bolide Slideshow Creator: Create Slideshows In Video File Formats Read More . As you can see, Bolide has a similar interface to VideoPad, but doesn’t have quite the range of options as the latter is a full-blown video editing tool The 5 Best Online Tools for Making Professional Videos The 5 Best Online Tools for Making Professional Videos There are lots of web-based video editors out there, sadly some aren't very good. Don't worry though, here's our list of the five best. Read More . This makes it perfect for those looking to add a touch of finesse without delving into video editing. This one can be handy if you have a bunch of pictures you want to display, but aren’t fussed about connecting music, or timing the show, or any of the other “frills” mentioned above. If you’re not aware, IrfanView is a really handy and versatile image viewer and editor that has heaps of advanced options just waiting under the surface. Its command line functionality is one those things. If you’d like to learn more, check out our excellent list of IrfanView command line functions 10 Useful Command-Line IrfanView Tools For Working With Images 10 Useful Command-Line IrfanView Tools For Working With Images These days, screenshot applications are a dime a dozen, and you can do image editing offline, online and even on your phone. So what's a new way that you can make use of image editing... Read More — you won’t be disappointed. 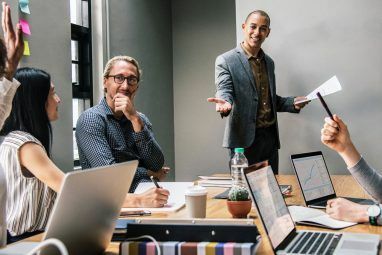 Of course, there is always the old work horse, scourge of 3rd Grade presentations across the land 7 Tips for Creating Professional PowerPoint Templates 7 Tips for Creating Professional PowerPoint Templates Nobody benefits from a boring PowerPoint presentation. Use these tips to make sure your efforts always grab their audience. Read More (along with Comic Sans), the PowerPoint presentation. 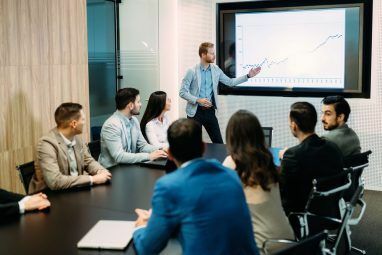 PowerPoint has the advantage of being relatively memorable for most users, as well as easy enough that beginners won’t feel overwhelmed with options. Below is a video illustrating how quickly a slideshow can be made. I’m using PowerPoint 2016 13+ Reasons You Should Upgrade to Microsoft Office 2016 13+ Reasons You Should Upgrade to Microsoft Office 2016 Microsoft Office 2016 is here and it's time for you to make a decision. The productivity question is -- should you upgrade? We give you the new features and the fresher reasons to help you... Read More , but the options are roughly the same as far back as PowerPoint 2010. You’ll find PowerPoint friendly to use, but with enough personalization options to make your slideshow interesting. Another bonus is the easy export feature. Head to File > Export > Create a video and select your options. You can then share the video of your slideshow, or upload to your preferred social media platform. Slide.ly is an online slideshow creator with a heavy focus on social media. It does have a pretty cool relationship with Getty Images, which allows you to use some of their beautiful shots as your own. As with all of our favorite tools, online or off The Best PC Software for Your Windows Computer The Best PC Software for Your Windows Computer Want the best PC software for your Windows computer? Our massive list collects the best and safest programs for all needs. Read More , Slide.ly keeps it really simple, and you’ll have a slideshow up and running in minutes. One of the biggest bonuses of using an online tool is the social media integration How To Add A Photo Slideshow To YouTube How To Add A Photo Slideshow To YouTube Videos have become only easier to compile, combine, and compose. YouTube crossed over to 1 billion users just a few days ago and despite the presence of very good alternatives like Vimeo, it is the... Read More . Once your slideshow is made, you’ll be able to instantly share it to your favorite social media network Deep Down We're All Monsters. That's Why Social Media Is Great Deep Down We're All Monsters. That's Why Social Media Is Great We all know that social media updates aren't always authentic, but what's actually happening to our identity as we post that update to Facebook, or send that video over Snapchat? Read More . If you’re the only one desperate to see those pictures of bespoke railway wheel flanges, you could display it on your Windows 10 desktop background. This isn’t a new feature to Windows 10 How to Set A Bing Wallpaper Desktop Slideshow In Windows 7 How to Set A Bing Wallpaper Desktop Slideshow In Windows 7 Read More , but the new operating system makes it easier than ever. You have two options, depending on the content you want to see 10 Hidden Windows 10 Photo App Tricks You Must Know 10 Hidden Windows 10 Photo App Tricks You Must Know Windows 10's default Photos app can handle most photo editing tasks with ease. 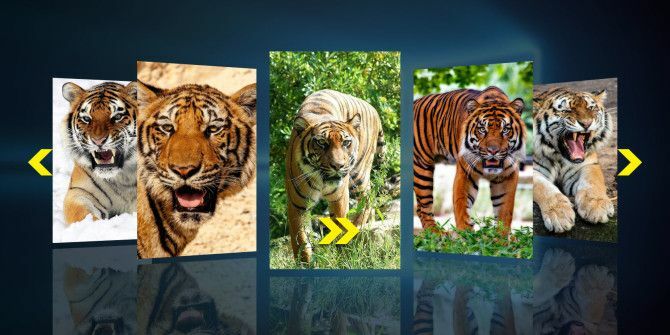 We'll show you where to find and how to use Photo's lesser-known features. Read More . I’ll show you both. For the first, head to C:\Users\YourUserNameHere\Pictures, and make a new folder called SlideShow. You can now dump any images you want to display on your desktop in that folder. Now you’ll want to right-click your desktop, and select Personalization from the context menu. Alternatively, press Windows key + I, then select Personalization from the Settings panel. Once you’re in the Personalization screen, select Slideshow from the dropdown menu. Now browse to and select the folder we created earlier. Finally, set how often you’d like the background to change, whether you want the images to shuffle, and whether you want the slideshow to continue when using battery power. My advice would be not to, as it can be a bit of a power-drain. Another thing to bear in mind is the color of your menus. If you have set your system to Automatically pick an accent color from my background, your color scheme will change with the desktop background. The second option follows the same process, but instead of using a designated folder containing specific images, you choose a top level folder, e.g. your entire Pictures folder instead of a single folder. You can draw from a whole host of options for your slideshow creation needs. 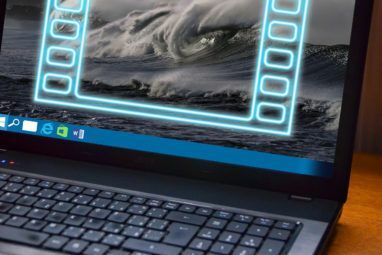 Windows Movie Maker may have disappeared from Windows 10, but that doesn’t mean your friends, family, and co-workers should be deprived of 48,000 photos of those cute new pets. Just keep the music tasteful 6 Fantastic Ways To Discover Cool Music You've Never Heard Before 6 Fantastic Ways To Discover Cool Music You've Never Heard Before If you’re a music lover, you’re familiar with the constant need to discover new music. You already know lots of good music you like, but the thirst for more is unstoppable. There’s lots of good... Read More , okay? What is your favorite slideshow creation tool? Do you think slideshows have had their day? What alternatives do you use? Let us know below! Explore more about: Microsoft PowerPoint, Slideshow, Wallpaper, Windows Customization.